In support of the Boys and Girls Club of Kern County (BGCKC), community members came together for an evening of fundraising, stories, and dinner with boxing icon, Sugar Ray Leonard, and acclaimed Sportscaster, Greg Gumbel on Feb. 19. Upon arrival at the Armstrong center in Niles street, the special guests were taken a tour of the facility before making their way to the gymnasium where they were treated to music and singing by the club’s performing arts team known as Fusion Music. Leonard and Gumbel spoke to the children at the club and answered a few of their questions. 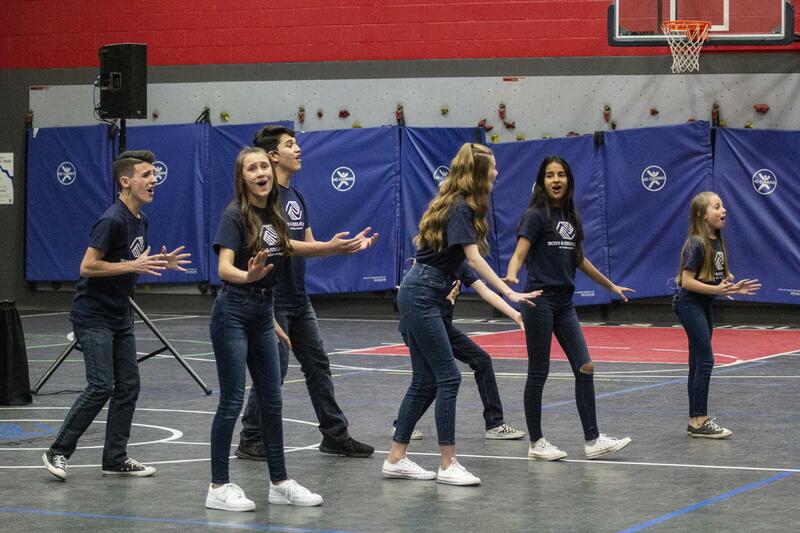 BGCKU performing arts team Fusion Music perform for Sugar Ray and Greg Gumbel in the gymnasium on Feb. 19. 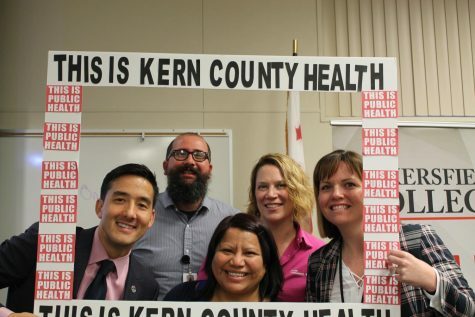 The children, staff and special guests at the Boys and Girls Club of Kern County. Greg Gumbel and Sugar Ray Leonard spend an afternoon with the children of the Boys and Girls Club of Kern County on Feb. 19. 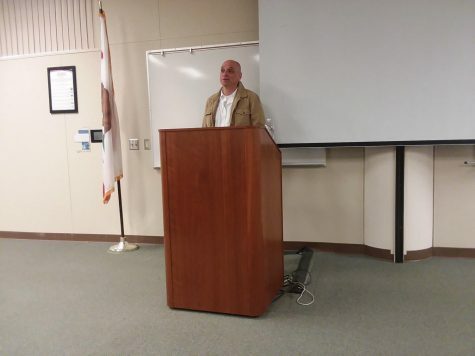 Aera Energy, who previously provided a new roof and solar equipment for the building, sponsored the dinner evening which was held in one of the buildings in the Kern County Fairgrounds. 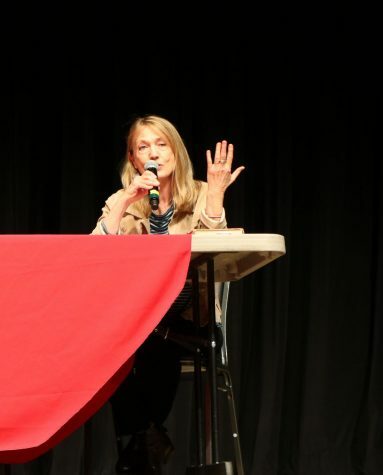 Aera CEO Christina Sistrunk, was one of the speakers at the dinner and gave her thoughts on the energy industry’s involvement in the community. 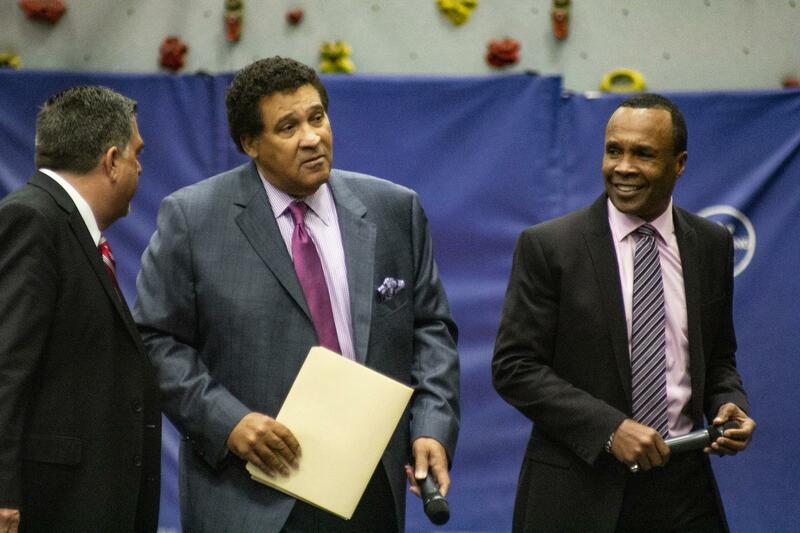 left to Right: BGCKU executive director Zane Smith, Greg Gumbel and Sugar Ray at the Armstrong You Center on Feb. 19. “A few months ago, I had the opportunity to go and spend an afternoon at the facility, what really stains in my memory is the dedication of the staff and their complete commitment to making each of the kids that come through all of the facilities everyday successful, and that is such an important mission,” Sistrunk said. According to the BGCKC resource development director, Maggie Cushine, the donations go into providing many of the children with club member scholarships, the Armstrong center is proudly entirely of scholarship children. This speaker event is one of two large fundraisers the BGCKU hold every year. In previous years their guests have included the likes of Condoleezza Rice and Laura Bush. 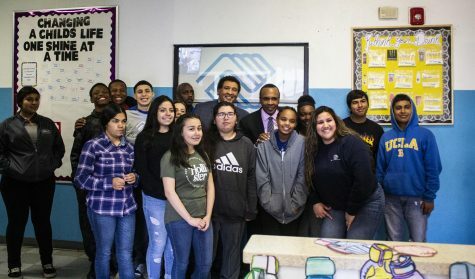 “It’s nice to have a club alum come back and talk to the kids…we’re grateful that he and Greg were able to come and spend some time with the kids, let the kids see what they can aspire to,” Cushine said. 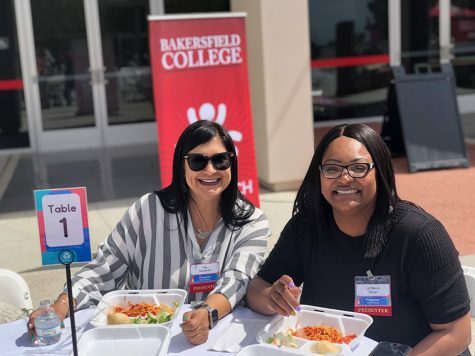 “This allows us to raise unrestricted dollars for the club, that means more kids can enter the club on scholarships, they can have more activities, more supplies that kind of stuff,” she continued. Sugar Ray and Greg Gumbel sit and talk about their lives in sports. Gumbel and Leonard started the night off with a couple of jokes and expressed their gratitude toward everyone who donated. They told stories from their pat and finally, answered questions from the audience. 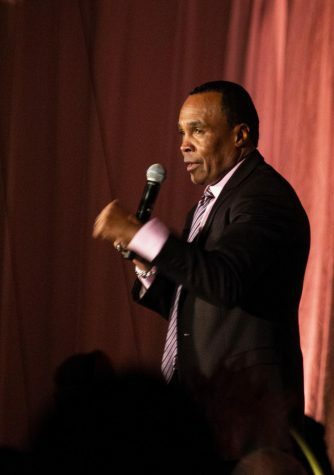 Leonard’s outlook on the potential of young people stems from his own life story: he grew up shy, found a place he felt comfortable in the Boys Club, as it was called back then, and began his boxing career to help his ailing father. His message to the kids is one of hope and optimism. 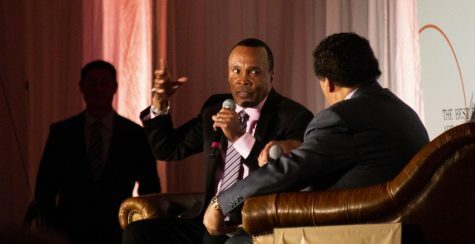 Sugar Ray demonstrates a few boxing moves as he recounts a story. “Anything is possible. I always tell people, mostly kids, to dream the dream, because your dreams are the window to your future, your goals are the vehicle that takes you there. take away those dreams you’re stuck in a room without windows. you take away those goals, you don’t have a map to get to your dreams. I tell the kids that your dreams are the GPS toward your success, and to go for it. Don’t let anyone tell you that you can’t achieve what your dream is. go for it,” Leonard said. 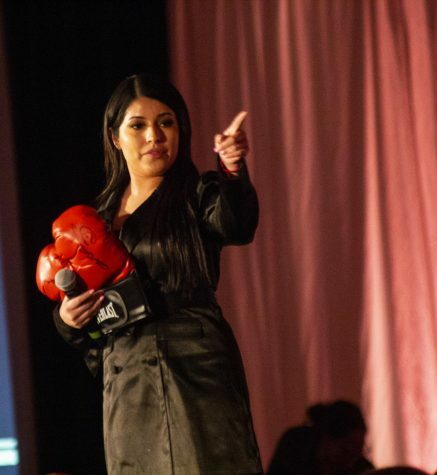 The night finished off with a few extra donations in the form of auctions. Leonard donated 10 pairs of autographed boxing gloves that were sold to the highest bidder. Juanita Recinos, program director of the Armstrong youth center searches the audience for bidders. The Boys and Girls Club will hold another fundraiser some time in the Fall of this year.